In the world of football, Carles Puyol is a legend. One of the best defenders in the history of the game, he led the Barcelona team to tremendous success. During his fifteen-year career, he participated in hundreds of games and won dozens of major titles. And today, as Euro-2016 takes off, he joins Sophie to give an insight into the path of a grandmaster. Sophie Shevardnadze: Just recently, Fabio Capello said that Barcelona are missing a captain like Puyol. What kind of a captain were you and do captains really play such an important role? 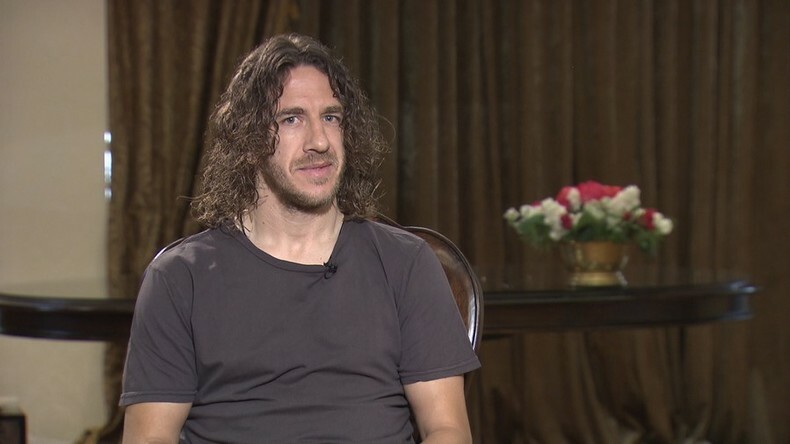 Carles Puyol: I would like to thank Fabio for his warm words. However, I think the team is fine as it is. Each player is in the right place. Certainly, the captain plays a very important role. He has to speak for the team in front of the fans and the media, he has to handle the behaviour of his teammates and help them out in difficult times.The captain also helps newcomers settle down in the new club. In short, the captain is a key figure in football. But the functions I described are performed not only by the captain, often it’s other players, too, particularly veterans. SF: Suppose you do become a coach eventually. Do you see yourself managing any other team besides Barcelona? CP: Currently, I don’t plan to become a coach. It’s a very challenging profession. You are in charge of 25 players, you dedicate yourself to football 24 hours a day. It’s extremely difficult. I was fully committed to my profession. I was in football 24 hours a day. The most important thing for me was to recover after every match and get ready for training and the next game. I worked really hard, and so now I need to relax a little bit and spend more time with my family, my wife and kids. I have two daughters, one is just five months old, and the other is two years and four months. I want to enjoy my fatherhood. Also, I run a project together with Iván de la Peña and Ramón Sostres. Its goal is to mentor young players, educate them about the profession of a football player and teach them how to enjoy it. So my focus is on that right now. It’s an inspiring project and I’m interested in taking it somewhere. SF: You’ve trained under many legendary coaches. What kind of a manager works best for a successful team — a strict and demanding one, or one who is first and foremost a friend to the players? CP: It’s all of it, really. A coach must be demanding if it’s necessary but should also give some degree of freedom to the players because we are all adults and we understand what responsibility is. We must know what we have to do but at the same time we need a certain degree of freedom. It’s not like we live in the barracks, taking orders like in the army.You can basically do what you feel is right but you need to remember about your responsibility. Josep Guardiola is a very tough coach but after a training session or a match players are free to do virtually anything, within reasonable limits. SF: Every season, when the transfer window opens, a new spending record is set. Do you think it is okay to pay 100 million dollars for a football player? CP: Football is about big money. I do not decide the price of this or that player. Football has always been associated with big money. That’s just how it is. But certainly such a high sum might seem far-fetched if you’re thinking about areas other than football. SF: I don’t mean that football players are not really talented or that they don’t deserve the price. On the contrary. But what about the clubs who don’t have millions to spend? CP: You need to work hard. I guess you can get the money if you really want it. You also need to remember that money cannot win you the title, you can only buy the best players to get a star-studded team. But victories are not only secured by money. This year, for example, the Premier League’s wealthiest teams did not manage to win the title, losing to Leicester City. It’s a team that doesn’t have as big of a budget as others do. It’s an excellent example of how you can build a strong team and work hard to achieve your goal. Good players are important but they also need to be able to work cohesively as a team. This is most critical for success. Teams with a smaller budget can always challenge their richer peers, like Atletico de Madrid, a more modest club, who is hard on the heels of Barcelona and Real Madrid. It means that Atletico work really hard and can become a role model for football clubs with a small budget. SF: Football today is a super profitable business. But what about young players who are just 18 or 19? How difficult is it to stay calm and reasonable when you become rich at such an early stage. Is it really possible to continue focusing on football? You had to go through all of this. What was your recipe? How did you manage to stay in touch with reality? CP: It all depends on the person and their environment. I grew up in a working class family and I always remember my background and keep the values that I was brought up with. My surroundings have always been normal. I didn’t need fancy cars, I didn’t need to buy things to show off my wealth. I lead a simple life. Football was my biggest passion, I didn’t dream of fame or money which football can bring. You touched upon an important issue. There is indeed a danger that some young people will lose touch with reality when they get this kind of salary. It’s a major issue. The higher you go, the more painful it will be to fall. This is why we created a program where we try to help young players value what they have and understand that money should not be a priority. Yes, it’s an important part of life but you should always focus on the most important thing and that is football. It’s not about earning quick money in two or three years. It’s about a long career of 15 years which can bring you fantastic money and secure a comfortable life for you, your children and your family. SF: You act as an agent now and guide young players through transfers. How crucial is the agent’s role? I remember a story when Luis Figo quit Barcelona to join your sworn enemy Real Madrid because his agent hastily signed a contract with them. What’s the power of agents over players? CP: Indeed, those agents do exist, but they don’t have a good reputation. They are after their own personal gains, earning their fee from transfers. I would like to move away from these stereotypes, to focus more on the players themselves, to help them and act like a mentor. It’s very important to have someone who guides you in your career, who takes care of you. It helps you to handle emotions. An agent who thinks only about money can easily earn a lot if he has a great player. He can move the player around from one team to another every year. However, the player won’t have the stability that he needs to really flourish. It might work out well, but I think that players need stability and a reliable person by their side to take care of them. Football players always experience strong emotions and live a very charged life. If a player has been benched, for instance, he might tell his agent that he wants to leave the club. But the agent must stay calm and wait a couple of days until the player calms down and wants to play again. I was lucky to be playing since I was 15 and I had to go through all of this, I lived through those emotions. So I want to use my experience to help the players I mentor. SF: So you are more of a mentor than a financial agent? CP: Absolutely. Players are a priority for me. Of course, I want my players to play in the best team and earn as much as possible. But money should never prevail over sport. SF: You held the World Cup in your hands but you also know what it means to lose big. What is the most decisive factor when it comes to winning a major tournament like that? Understandably, both teams must be strong if they made it to the final - so does it all amount to luck? CP: It’s not only luck. Ultimately, it depends on many factors. The World Cup takes place at the end of a very busy season and so you need to look at the opposing team - the shape they are in and how tired they are. You need to look at whether it was a long season for them personally, whether they made it to the finals of those events, whether they won or lost. Morale plays a huge role. Also, it’s important to have a good lineup, a roster of players that are eager to play and enjoy it. You might have a star lineup, but if they’re not ready to play as a team - they will fail. So they need to be a real team. You need to be on top for seven consecutive games. If you make at least one mistake, you are out. So there are moments when you need luck, but you also need to work hard, show professionalism and you need to have talent. It’s a little bit of everything. You can’t claim that you won such a major and difficult event as the World Cup only through luck. This would be a huge injustice to the players, because there are so many factors behind this kind of victory, and first of all, it’s down to hard work. SF: Football is said to be the only sport without doping. Is it true that football players don’t need doping? CP: I’ve never heard about any positive doping cases in football, particularly in Barcelona. We were once accused of doping, but it was a lie. It’s the ball that moves most in our sport, not the players, so the players need to know how to handle it. I have not heard of any substance that would enhance the performance of a football player.Yes, you can feel stronger and more resilient but football is all about handling the ball, so you need to have the skills to control it. So, it’s true, there’s no doping in football, there’s only hard work and talent and the ability to control the ball. SF: Before the World Cup in Brazil, FIFA did a doping test on every player, spent massive amounts of money on it. Do you think it’s a waste of time and money? CP: I don’t know. Indeed, there were doping tests ahead of the World Cup in Brazil - I wasn’t there because of a knee injury. A lot of tests are done before major football events, like the World Cup, or European tournaments and even at club level. There are so many tests that I think it would be silly to abuse banned substances. There are about 15-20 checks a year and they can be held at any moment. If you test positive, you would be suspended for two years, and your reputation would seriously suffer. I think it’s silly to play these games. SF: Are you planning to come to Russia for the 2018 World Cup? If yes - in what capacity? CP: I hope I will be able to come. The World Cup is always a festival, a major event for the football world. We, as fans, always want to be a part of it, to enjoy it. It’s a fantastic event for football players and for millions of fans and football lovers. It’s wonderful to have the opportunity to get a flavour of the atmosphere of the World Cup. So yes, I am planning to come to Russia. In what capacity? I don’t know. I hope I will still be in charge of my agency. And I hope that the upcoming World Cup will feature many strong players. SF: You made your way up through Barcelona’s lower and youth squads all the way into the top eleven of the main team. Does it mean that there was a person who noticed you, discovered your talent? How can you really identify that this or that particular player has a gift when he is sitting on the bench, for instance? Is it just intuition? SF: I am sorry, I think I didn’t make it clear enough. I was asking, how can people identify those talents. Suppose you see a young player on the bench. How do you know he’s going to be a star? Is it intuition? CP: OK, I got you. It’s really hard to do it when the player is on the bench. But when he’s out on the pitch you just watch him and pay attention to certain details, and make conclusions. We are lucky to have Iván de la Peña in our agency who really has an eye for it. I’ve known him for a long time. Back then, he played in Espanyol while I played for Barcelona. He would often come over to me and ask me about some young player (like 14-year old Neymar or Coutinho or Douglas Costa). He always paid attention to young players who were not famous at the time but who have grown into stars today. He would always tell me: “Keep an eye on that guy, he’s very good”. So I am very happy that he is part of our team. He’s in love with football, he’s really passionate and loves everything related to it. We seek new talents. We want to discover them and guide them to a long and happy career. SF: What do you think about a limit on foreign players? Is this the right solution? There are big clubs like Barcelona, Ajax or Man United which have their own academies. And there are clubs who buy many foreign players. Do you think that tough limits on foreigners can help bring up domestic talents? CP: A club’s academy is a great thing to have. Barcelona has always produced very strong players. It’s one of the best places to train because every club has its own philosophy and it’s really important. If there’s anything missing, you have to try and find it elsewhere. But for me, the core of the team needs to consist of local players. In this case, the team spirit is stronger. I also agree with Barcelona’s philosophy – you need to produce as many good players in your own academy as possible, and only if some position is still not filled, then you start looking elsewhere. There are clubs who don’t have a youth team and simply buy players from other clubs. Different clubs have different visions, and we need to live with that. But I personally like Barcelona’s concept more - that you need to bring up your own players. And the fact that we won every title possible with the help of our own, homegrown young talents demonstrates our success and is a source of pride for all our fans. SF: You have been known as a player who works hard and trains a lot. What is more important – to have a talent or to work hard? For example, no matter how hard I try, I won’t become a composer. Is it more a gift or if you work really, really hard, you can make it, too? CP: I think you need both. I have always worked hard. When I joined Barcelona’s youth team, I might have had less talent than others, but neither of them had such a passion to go to the top as I had. At the same time, you still need to have the makings of a good player. Today I work as hard as I did but I would still not be able to play the piano or dance – simply because I don’t have an aptitude for this. So you need to have that ability but you also need to translate that into practice every day by working hard and perfecting your skills. This is how I did it when I was still playing. Throughout my career I saw highly talented players who did not show perseverance and that’s why they didn’t make it. And I also saw players with less talent but who had a dream, a huge desire to succeed - and they were able to go to the top league and have a long career. Again, you need to have both. If you have bright talent and you are extremely hard-working, you can achieve the same as Messi and Cristiano Ronaldo — you can become an icon of a whole generation. SF: Why didn’t you ever try your luck elsewhere – in other clubs or leagues? Were you never tempted to win titles in other countries, work where they speak other languages? CP: I was lucky to play in Barcelona. It’s my club, and my heart belongs to it. I moved from one level to another until I joined the main team. This was a dream come true for me. At the beginning we struggled for five years with no trophies. It was very difficult for me. But after Frank Rijkaard and Ronaldinho joined the club we were able to build a strong squad able to become champions. In 2008 Josep Guardiola came to the club as a manager and that’s when the best time of my life started. That’s when we won every title possible. Indeed, I got lots of offers from other clubs where I could have earned much more money (although I probably wouldn’t have earned as many titles as I did with Barcelona). I am proud that I remained loyal to my club – my heart prevailed over business sense. It was important for me to stay at home, with my friends and fans. But I don’t blame anyone for switching clubs. It gives you an opportunity to experience life, see other cultures, learn more about different perspectives on football. I didn’t have that experience but I was happy in the club which I can call the club of my life.